Yesterday afternoon, four paintings were stolen from the E.G. Buehrle Collection in Switzerland in the largest art robbery in Switzerland's history. Three men in ski masks stole the paintings at gunpoint at 4:30 p.m., half an hour before the museum's closing. 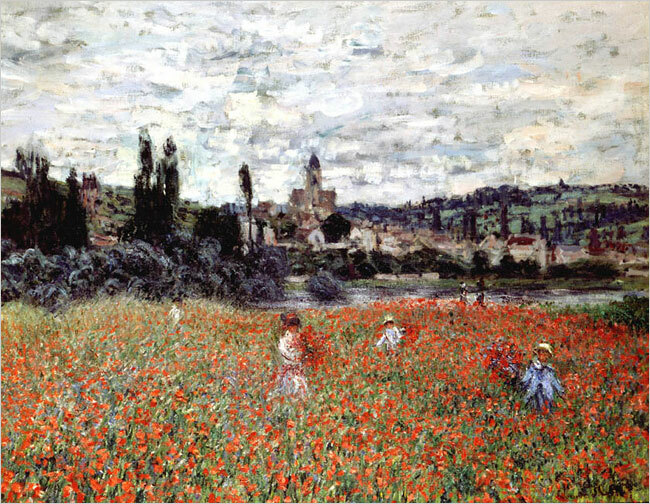 The four paintings—Claude Monet's "Poppy Field at Vetheuil," Paul CÃ©zanne's "Boy in the Red Waistcoat," Edgar Degas' "Count Lepic and his Daughters," and Vincent van Gogh's "Blooming Chestnut Branches"—were stolen so quickly (only three minutes) that the 15 visitors in the museum were not aware of the robbery until the alarms sounded. The theft has drawn enormous media attention, covered by the New York Times, USA Today, and Time. There is a $900,000 reward for information leading to the recovery of the paintings. Claude Monet started his artistic career in his teens while attending the Le Havre secondary school of the arts. He would sell charcoal caricatures for ten to twenty francs. His paintings are now worth several millions of dollars and have been the target of art thefts before. "Cliffs Near Dieppe" was stolen in 1998, after which it was recovered, only to be stolen again this past August; it is still missing. A larger version of the painting is available here. Both Matisse and Picasso are said to have remarked that Paul CÃ©zanne "is the father of us all," as his style bridged the gap between Impressionism and Cubism. Although three alternate versions of "Boy in the Red Waistcoat" reside in museums in the United States, the stolen painting is still worth about $100 million (the bulk of the value of the theft). Emil Georg Buehrle had considered the piece to be "the signature painting of his collection. " A larger version of the painting is available here. Unlike most family portraits, "Count Lepic and his Daughters" was not commissioned. Ludovic Lepic was a friend of the Impressionists and, as a sculptor, also exhibited with them. Edgar Degas again painted the father and daughters in "Place de la Concorde. " Degas honed his skills copying paintings at the Louvre, where he met Ã‰douard Manet. (Claude Monet had also met Manet during visits to the Louvre.) A larger version of the painting is available here. 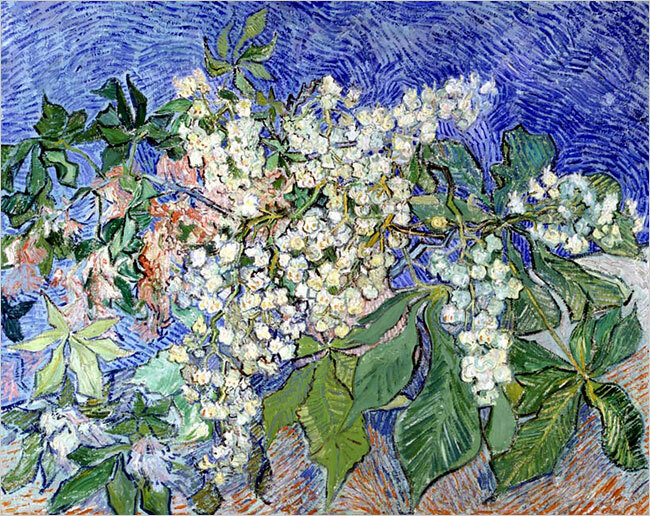 "Blooming Chestnut Branches" was painted in Auvers-sur-Oise, where Camille Pissarro (discussed in November) and Paul CÃ©zanne had also worked. After van Gogh's death, the painting passed into the hands of Dr. Paul Gachet, who had taken care of van Gogh and had hosted the artist in Auvers-sur-Oise. A larger version of the painting is available here.